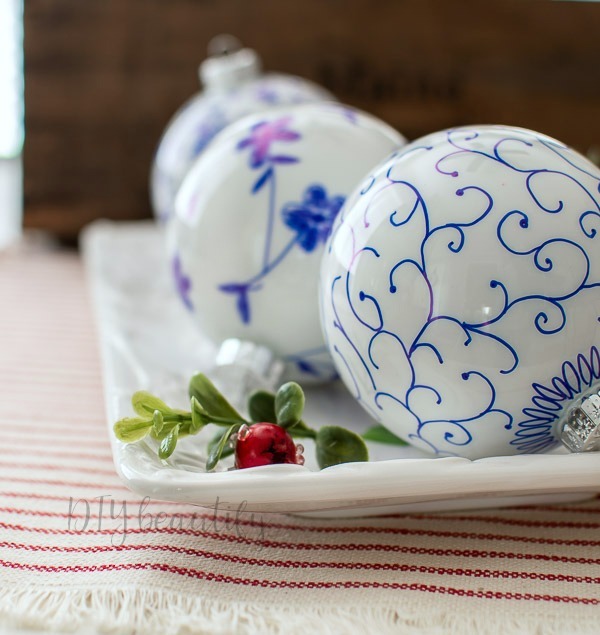 These beautiful French farmhouse ornaments are easy to make using just two products! 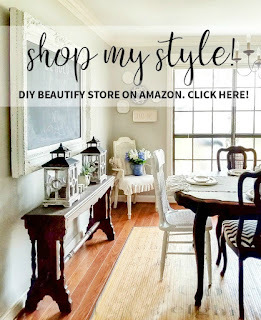 Easy to customize, inexpensive to make and they'll add French country style wherever you use them! I know I've said it once or twice here, but I really love blue and white! 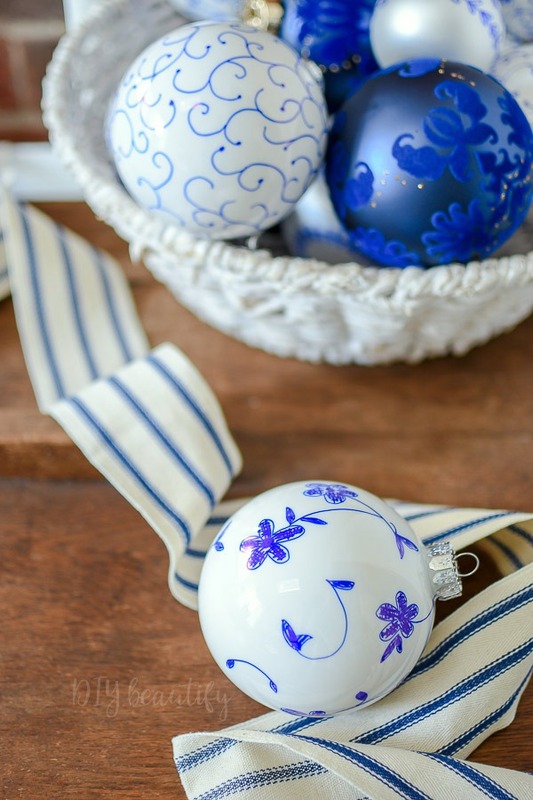 I love using it in my home decor, I love vintage transferware dishes and toile patterns, and today I'm sharing how easy it is to make blue and white ornaments that are reminiscent of French farmhouse dishes! Today is Thrifty Style Team Wednesday. Have you missed us? We've taken a bit of a break but we're back again to share our thrifty inspiring ideas with you. You'll find the links to the other projects at the end of this post. 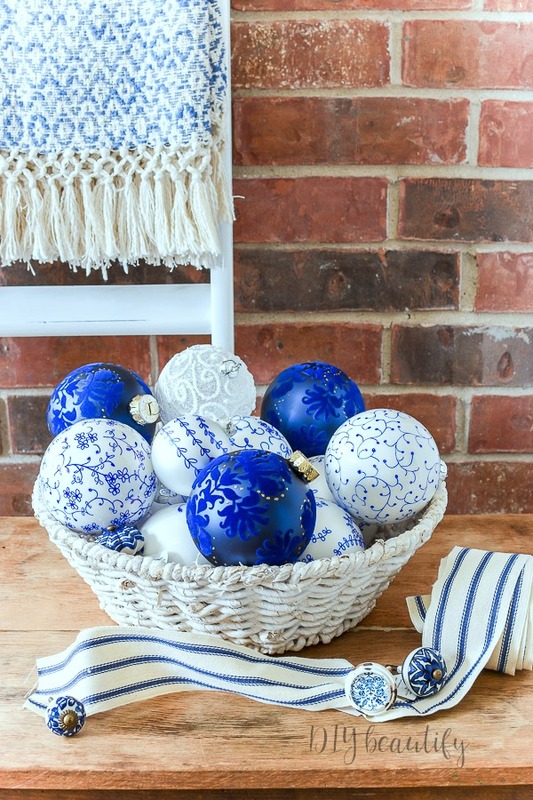 I was inspired to make these French farmhouse-inspired blue and white ornaments when I dreamed up my blue and white Christmas tree! The tree is filled with DIY ornaments (like my chippy spindles), which is such a great way to save money during the holidays! 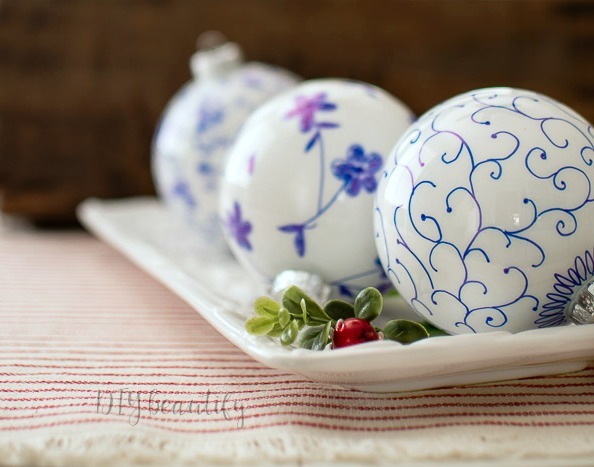 My vintage blue and white dishes have such pretty patterns, and I wanted to try to replicate them onto Christmas ornaments. I made a sign in the spring with these pretty patterns, so why not ornaments! Florals have made a huge comeback, which makes me so happy as I have always adored florals! Don't be overwhelmed by this project, it's so much easier than it looks...and it's quite therapeutic! It reminds me of adult coloring books! If you're like me, you can't draw a person to save your life...but flowers? leaves? swirls?...easy peasy! 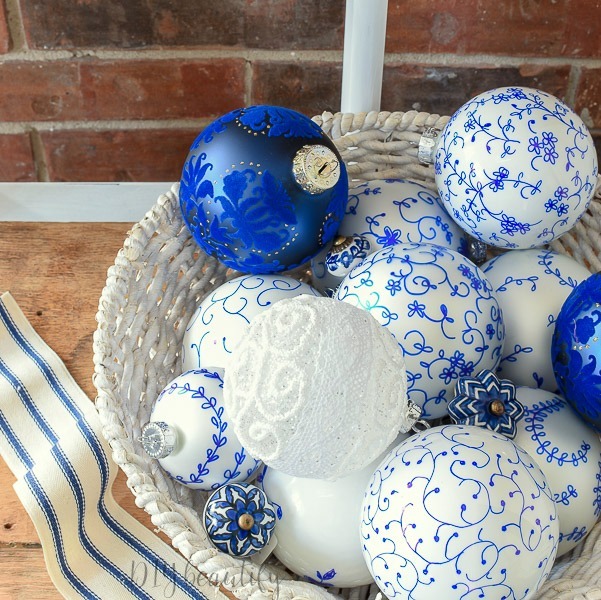 Here's what you need to make these easy blue and white Christmas ornaments. shiny white ball ornaments (I like to vary the size with something like these in the 2-3" range and large ones like these) Check your local craft stores, and use a coupon if you can! 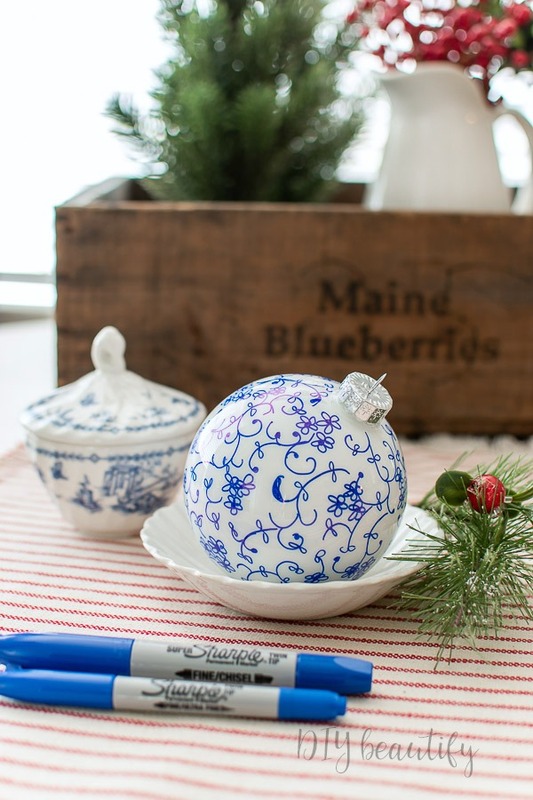 Take the tops off your ornaments and just start drawing! You can see that I kept my designs very simple and repetitive. 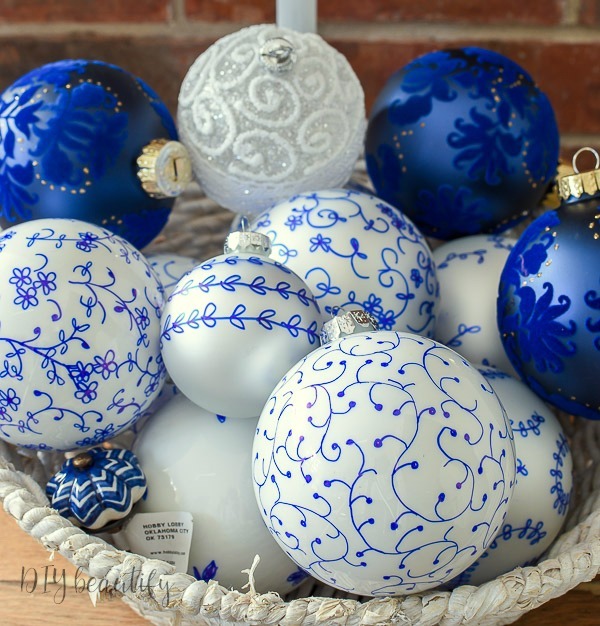 Don't worry about mistakes; once the ornaments are hung up, you don't notice too many details! In fact, if you look closely at mine, they are FAR from perfect! 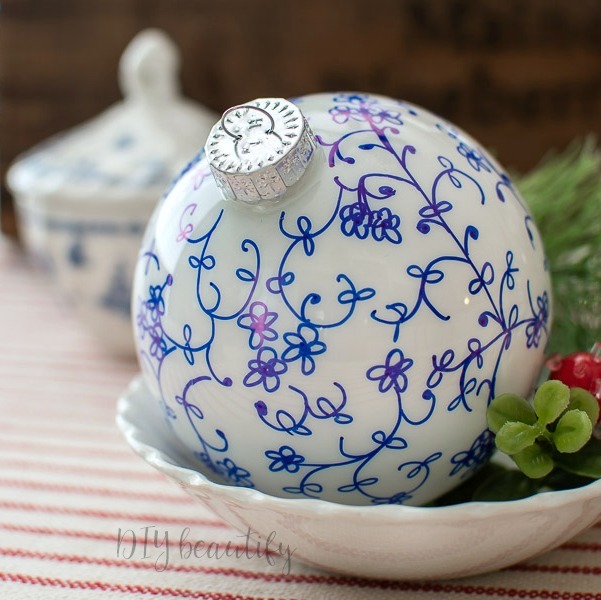 Try to vary your designs with thicker parts, or fill up the ornament with thinner lines and swirls like you see above. Believe it or not, it goes fast...and it's very addicting! The Sharpie dries almost immediately, so there's no waiting time and your hands stay clean. 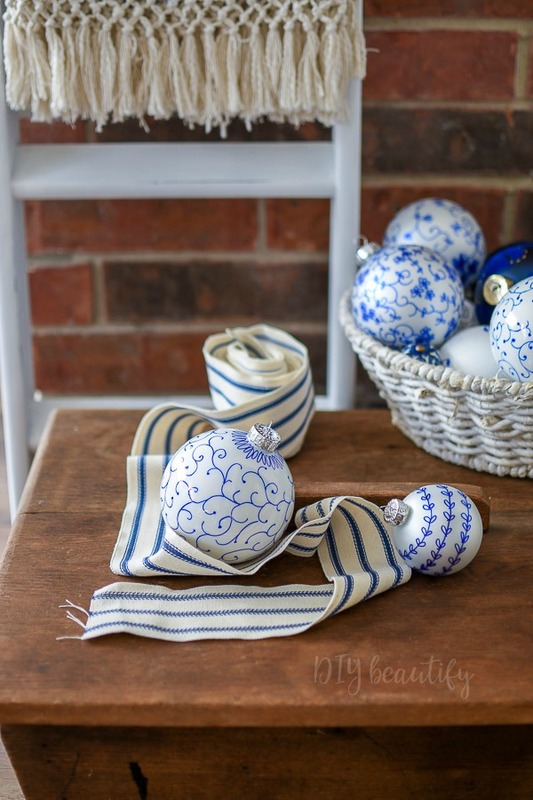 The ribbon and knobs you see here are all used on my blue and white tree! You can see it here. 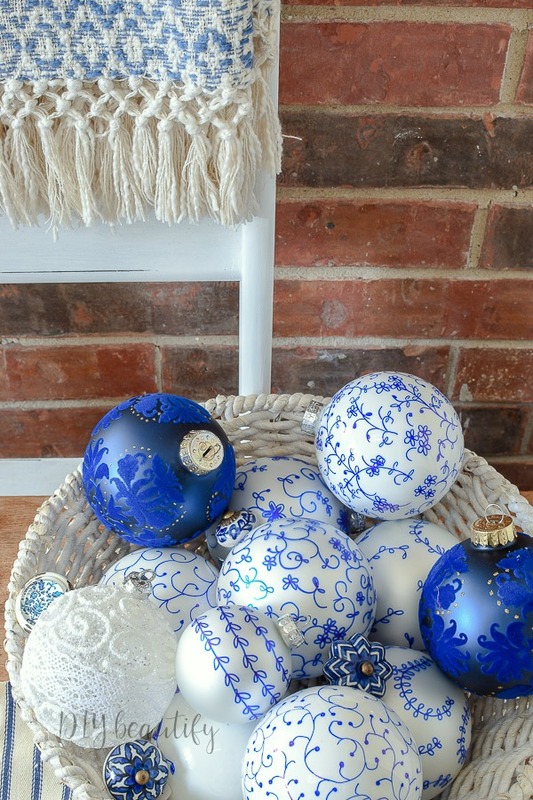 Display your ornaments in a basket or hang them on a tree! They will bring a beautiful French farmhouse feel anywhere! And if you're not a fan of blue and white, make them in a different color! 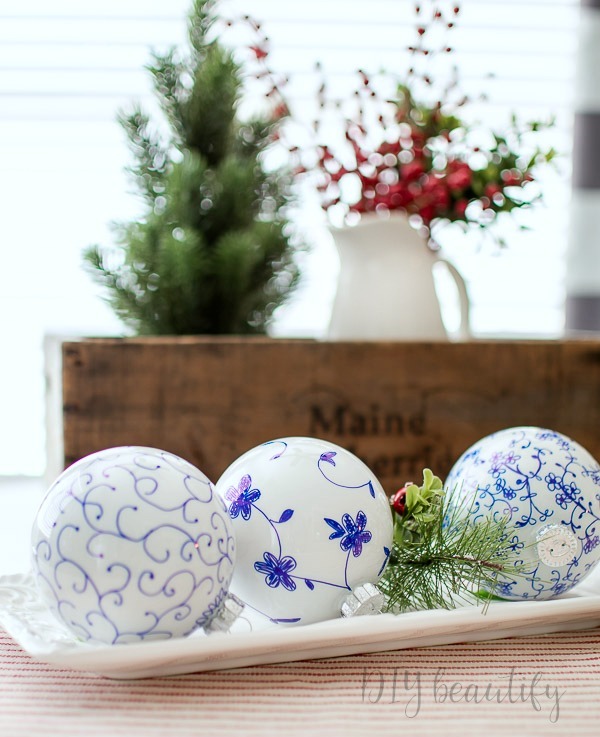 Make them to match the china you inherited from your grandmother and use them as table decor! 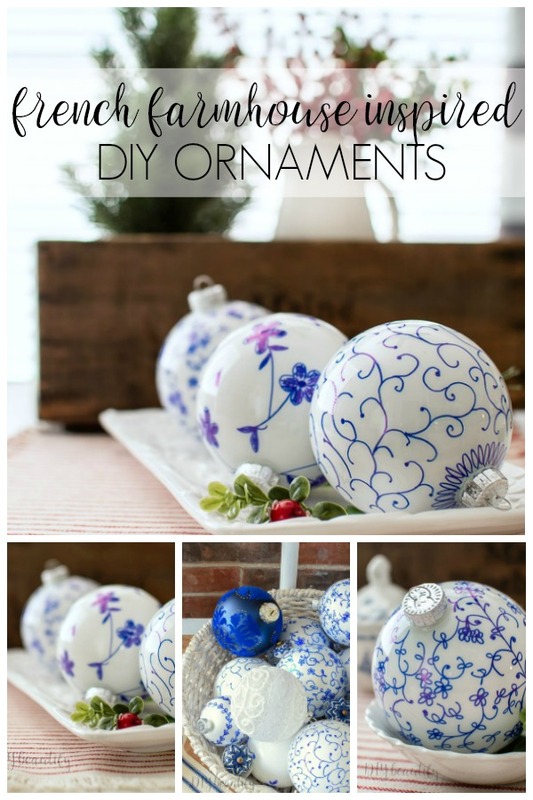 I would love to know if you try making these French farmhouse ornaments! Please SHARE and PIN this image if you enjoyed this project! They turned out beautiful and your patience is amazing!!! Cindy, You did an amazing job! Your attention to detail is impeccable! Simply stunning and beautiful. Thanks for the idea and tutorial. Very pretty! I love blue and white.